We are seeing an increased interest for the all-electric Formula E championship by established automakers. 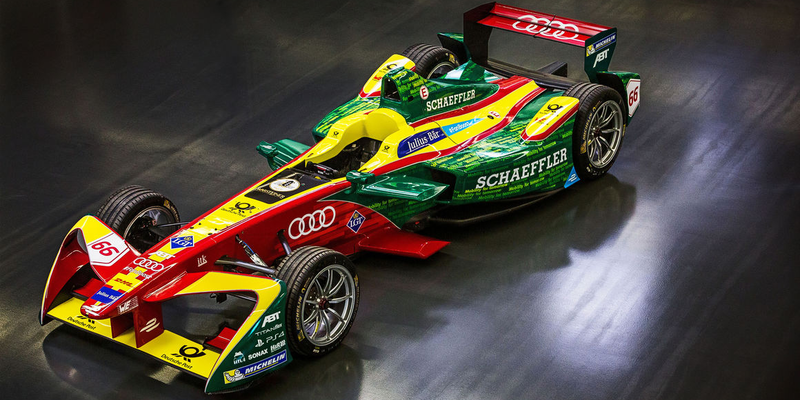 After Jaguar creating its own team earlier this year, now Audi announced its increased involvement with the Formula E Team ABT Schaeffler Audi Sport ahead of the 2016/2017 season starting next. They are moving from what could more easily be described as a sponsorship to a complete partnership in the program and they unveiled a new race car skin – pictured above. Furthermore, The German automaker confirmed that it will incorporate the team into its factory-backed motorsport program before the 2017/2018 season. Ullrich makes it sounds like the Formula E will be used as a test bed for Audi’s, and likely the whole VW group which heavily investing in EVs, future electric propulsion technology. Now Audi is joining Jaguar, Renault and DS Automobiles (Citroën-Peugeot) as established automakers behind Formula E teams. Electric vehicle startups have also taken more prominent roles in the championship. NEXTEV has been involving in the project since the beginning and earlier this year, Faraday Future pretty much took over the Dragon Racing team. The next season of the Formula E will start October 9, 2016 in Hong Kong.